It is free, well stocked with material the patrons want, need and use in languages they are comfortable with. The staff is exceedingly friendly and helpful and programs serve all our neighbors. As someone who suffered the “station” on 15th for years and had to beg rides to the Columbia City “branch” for homework in the 60’s, I say our library is a dream. Get over the outside, Mom said it’s what’s inside that counts. And she was right. I don’t know anything about architecture, and how it represents multiculturalism or the powerlessness of immigrants. All I know is whether I respond to the aesthetics of a building or not. And, to me, the Beacon Hill library definitely adds something to the neighborhood. I find it to be an attractive building on the block. In fact, to my untrained eye, I feel like it is a good representation of an architectural style that seems prevalent in Seattle. That is, the building looks very “Seattle” to me. I think it adds something to the neighborhood. And, I think it’s irritating that the author chose to use his forum to bash a neighborhood building instead of speaking to the growth of the neighborhood. So many Seattlites have never even BEEN to Beacon Hill, and this certainly won’t drive them here to check out the great restaurants opening or the amazing park the neighborhood has. If the author wanted to complain about something he should have written about Beacon Mountain being closed for the last 6 months, after being open for only a couple short months. An opinion is just that and that is his… I don’t agree. I quite like the look of building. It is interesting to look at, like the downtown building. Thankfully much more aproachable than the downtown building. And another thing does he even live in the area? If not he should use the platform he has and use it to do something positive rather than complain about the architecture. I think Charles Mudede should find another profession. His writing blows and shames all minorities with its ignorance. I rather like the look of the building. I feel it has become a nice North Beacon Hill landmark. Of course the Stranger is popular for it’s “entertainment” value,and no credible news. Which includes Mudede’s also “expert” opinion on our beautiful Beacon Hill Library that contributes so much to our community. What christina said. My first thought when I read the post was whether Mr. Mudede had ever been in the previous building on 15th and Beacon. Of course, I probably would have squawked even if he had dissed THAT building. 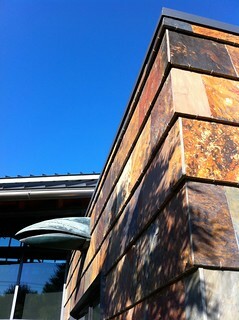 The Beacon Hill branch is MY library and I’ve loved it regardless of the architecture. Yes, he lives in columbia city I think. I’ve been totally bemused by Mudede’s comments. And I can’t resist saying you can’t tell a book by its cover! The library is soooooo much better than the barely room to turn around old one. It’s always being used and I love walking by the children’s section during story time. Coming from Chicago and its much vaunted architecture, I think our library is a wild mix, just like Beacon Hill. No surprise that a journalist from The Stranger would make an insulting shock-value statement just to get attention. Sounds like many of their articles. They (not Mudede) may have won a Pulitzer but they’re still endlessly juvenile. The BH library rocks. What is this, “neighborhood wars”? In next week’s issue, “My library can beat your library up”. The library is a beautiful, inspiring building. If anything, I wish it was larger and had a bigger parking lot. Mudede is a nice guy in person but doesn’t seem grateful for the good things in the city. I do think multiculturalism is out of control in this city. If anything, shouldn’t the library reflect the Italian American heritage of Beacon Hill?